Using an exercise ball can strengthen your core body muscles, increase your sense of balance and tone your entire body. Integrate an exercise ball as part of your fitness program with these titles from our digital collections! A full-color photographic book with 101 different moves you can do with an exercise ball. Exercise balls are cropping up in gyms all over the world, are sold in places like Kmart and Target, and are becoming the latest fitness craze. The thing is, what the heck do you do with the ball once you've bought it? Pilates, yoga, and more! Liz Gillies, respected fitness trainer and star of several best-selling exercise videos, shows you 101 things you can do with a ball to tone, trim, and firm up. 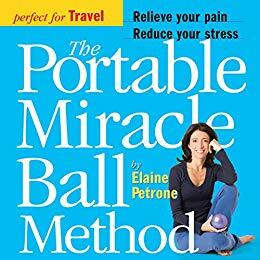 Introducing The Portable Miracle Ball, a book of simple exercises for pain and stress relief with an inflatable Miracle Ball. Ideal for business travelers and commuters or anyone who spends long hours away from home, these exercises require only one ball (which packs easily and is discreet to use in public) and can be done anywhere and everywhere. The fully illustrated book is filled with simple exercises that work miracles the minute you settle into your hotel room or board a plane. Stuck in a long line at the bank? Here are techniques to stretch the muscles and reduce tension right on the spot (and no, you won't look silly). Feet worn out after a day at the museum? The author's soothing exercises targeting the insteps and legs will have you up and moving again in no time. And for anyone who experiences discomfort when sitting for long periods, the book features exercises to be performed at your desk, on a plane, or even in a restaurant. Suffering a career-ending, potentially crippling injury to her back and right leg, a young dancer named Elaine Petrone tried everyone from orthopedists to yogis to turn her pain and prognosis around. Nothing worked--until she healed herself through a unique program of therapy and exercise based around the use of two small, squishy balls. From there she turned her passion into a mission that is helping the thousands of people who visit her classes conquer pain, stress, and injury. Now, for relief for sufferers everywhere, comes The Miracle Ball Method. The work itself is simple. Take a sore back: By resting your aching back on grapefruit-sized balls and letting your body sink into them, you're unworking the muscles that hurt. Pain and tension drain out of the body. 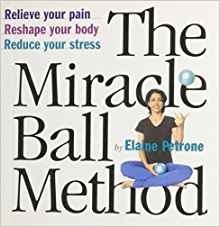 Petrone shows how proper breathing (which she demonstrates) works in conjunction with a range of unexercises that call for placing the balls under the back, head, knees, hip, elbow--wherever there's pain--and then resting, rolling, or rotating on them. She points out that relief can come in surprising ways: Lower back pain may be helped by placing the ball under your neck, or a bad knee might be helped by hip work. It's a revolutionary program of relief, from head to toe. Weights are great for working the arms and upper body, and the exercise ball produces exceptional results in the core abs and lower body. 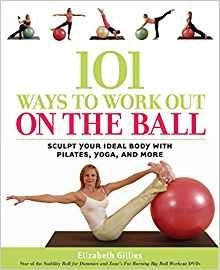 With exercises suited for all skill levels, Weights on the Ball Workbook shows how to simultaneously use both pieces of equipment for the ultimate total-body workout. Just sitting on a bench while performing arm curls leaves abdominals doing virtually nothing and leg muscles completely relaxed. Sit balanced on the ball while doing those same curls and a simple arm movement explodes into a total-body exercise as the mid- and lower-body stabilizer muscles are forced to work equally hard. Weights on the Ball Workbook teaches combination exercises like seated curls as well as dozens of specially designed movements that fully utilize the potential of this unique equipment tandem. 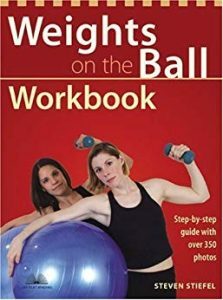 In addition to programs that are easily tailored to individual fitness levels, Weights on the Ball Workbook describes proper training methods and explains how to achieve specific goals by varying the workout and carefully monitoring the number of repetitions. Last but not least, the author shows how to have fun and enjoy a workout that produces results in half the time of a traditional workout. Here is 60 Minutes of Workout Songs to keep your routine going.